We've all sat in a dark movie theater munching greasy, butter-flavored popcorn and wondering how many inches it will put on the waistline. And a steady diet of it could do just that, since a large popcorn (32 ounces) from your local theater comes out at 4,200 calories and 290 grams of fat—and that's sans the extra butter. Does this mean you have to starve your way right through the credits? Not at all, says Ann Margaret Kane, R.D., a nutritionist in West Caldwell, New Jersey. "There are so many low-fat, low-calorie alternatives out there, you can basically get a skinny version of just about anything—for less than two hundred calories per serving." We asked Kane to give her Academy award-winning suggestions for cinema snacking in 250 calories or less. 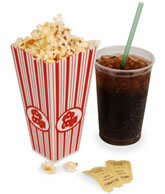 Pop Culture Tote microwave popcorn to the theater—and make sure it's at least 94 percent fat-free, suggests Kane. (Six cups of Pop Secret 94 Percent Fat Free Butter has 110 calories and 2 g of fat.) If you opt for air-popped, pep it up with nonfat butter spray, flavored salts, or a sprinkle of butter substitute. Chip Shots "Pretzels are great because they're naturally low in fat," says Kane. You can buy a soft pretzel at most theatres or tote a handful of salted twists (one ounce of Rold Gold Tiny Twists has 110 calories and 1 g of fat). Baked tortilla chips are another option with 1 to 2 g of fat per serving. Most Guiltless Gourmet varieties have 110 calories and 1 or 2 g of fat per ounce. Wise Crackers "There are tons of lower-fat crackers out there, like Wheat Thins and Triscuits, each with 3 to 4 grams of fat per serving. And saltine crackers are good choices as well with only 1 gram of fat," says Kane. Smart Cookies Instead of no-fun fat-free cookies, Kane recommends simply easing off on the fat content by a couple of grams: "The serving size is too small for Snackwell's cookies, so you may end up eating triple or quadruple what is listed." Instead, she says, try animal crackers or Nilla Wafers, both with 3 g of fat, or Fig Newtons (two bars are 210 calories, 4.5 g of fat). The White Stuff Up your protein and calcium intake with Healthy Choice String Cheese Snacks, each with 50 calories and 1.5 fat grams. And if you're a yogurt fan, Yoplait's Go-Gurt (80 calories, 2 g fat) is easy to tote and pushes up like those sherbet pops you used to purchase from the ice cream truck. And Columbo's latest is also portable, with the spoon built right into the top (Light Key Lime has 100 calories and 0 g of fat). Soy Meets Girl (or Boy) Edamame, or soybeans in the pod, is low in fat and high in protein. A one-half cup serving weighs in at 99 calories with 2.5 g fat and a whopping 10 g of protein. Rice Try Rice is a nice change from popcorn, and just as low in fat and calories. Consider Japanese rice crackers (16 have 110 calories, 1.5 g of fat) or cheesy Pirate's Booty from Robert's American Gourmet (one ounce has 120 calories and 2.5 g of fat). Sweet Nothings If you can't resist the allure of buying movie snacks at the theater, Kane suggests opting for lower-fat concession standards like Twizzlers (a 2.1-ounce serving has 200 calories, 1 g of fat), Junior Mints (a 1.84-ounce serving has 210 calories, 3.5 g fat), and gummy candy (a 1.5-ounce pack of Haribo Gold-Bears has 150 calories, 0 g fat). Desire six-pack abs or skinny jeans? Here are tips for trimming excess belly fat.